Got gophers? If you’re a gardener in the US west of the Mississippi, you probably just said “Yes,” possibly followed by some expletive. It’s disheartening to lose the veggies that you’ve worked hard to cultivate at the hands (or the teeth) of these rascally rodents. For me, the last straw was the demise of a third lovely old English rose bush planted by a former resident. But using traditional poisons will also poison into your organic soil. Rain brings the poisons down into the water table. Poisoning gophers also poisons their natural predators such as gopher snakes, owls, bobcats, foxes and coyotes: your friends in gopher control. And of course, poison is unsafe around children and pets. Luckily, our neighbor Thomas Wittman is an expert at controlling pest animals without poisons. His website, GophersLimited.com offers a lot of information, products, and services regarding all sorts of four-footed pests. An expert in resolving “animal and human conflicts,” Thomas teaches classes, one of which my husband and I attended last week. Using some of the many things we learned plus some additional research, I've put together a few practical ideas for outwitting gophers without resorting to poisons. 1. Gophers eat certain plants less frequently, mostly those that contain aromatic oils, which they seem to find distasteful. 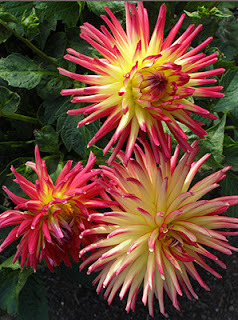 Try growing these to discourage an invasion. Many of these plants are drought-adapted California and US Southwest natives, so will also minimize your watering needs. Most varieties of sages and lavenders, as well as marigolds, geraniums, dianthus, amaryllis, daffodils, cannas, snapdragons, dahlias and most iris are on the gopher dislike list. Note that they do like cilantro and tulips very much. 2. Gophers favor watery plants, since they do not drink water. Veggies like carrots, beets, parsnips, potatoes, artichokes, asparagus, and onions are favorites. Rotate the areas in which you grow these crops every year, if you have the space, to reduce the likelihood that gophers will build a run (burrow) to these plants. 3. Gophers are attracted to most clovers, especially crimson clover, which is a popular cover crop. Try substituting sour clover (Melilotus indica). Sour clover is high in coumarin, the original source of the blood thinner Coumadin. Gophers avoid ingesting sour clover, possibly because the coumarin adversely affects their blood chemistry. Sour clover fixes nitrogen, reseeds easily, and has flowers that attract bees. A lot of plants are called sour clover, including oxalis, so be sure to get Melilotus indica. Gophers love oxalis! 4. Gophers will avoid many strong smells and tastes. Try fertilizing your plants with fish emulsion. You’ll be fertilizing organically and discouraging gophers at the same time. I use E.B. 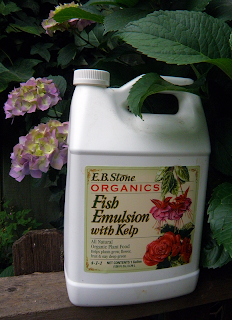 Stone fish emulsion with kelp, but any sufficiently smelly brand will have the same effect. 5. Try a physical barrier, if none of the previous methods work. Use either gopher baskets for individual plants, or raised beds with wire mesh bottoms. Galvanized metal baskets are available, but the galvanizing process is so toxic that it’s outlawed in the US. More world-friendly alternatives are Nophers’ stainless steel baskets. They’re more expensive, but unlike galvanized metal baskets they will never need to be replaced. For raised beds, be sure to use gopher wire or galvanized hardware cloth with ¾” (or ½” x 1”) mesh. Larger mesh will allow gophers to enter. Don’t use aviary wire, which will disintegrate because it’s not designed to be buried. To ensure gophers won’t climb over the top of raised beds, build them 2 feet deep. The weak point of a raised bed, in terms of gopher control, is where the wire is attached to the edges, particularly at the corners. Run the wire mesh up onto the outside or inside of the walls, and screw on lattice on top of the mesh for reinforcement. Yes, this takes a bit of finesse, but it will prevent a gopher from clawing through and eating up the fruits of your hard labor. 6. Feline-loving readers have doubtlessly noted that some cats hunt and eat gophers. According to experts, tabbies, especially orange or gray ones, are the best candidates. Oddly enough, a well-fed domesticated cat is a better hunter than a (non-feral) cat who is allowed to go hungry. Cats given a small amount of food will tend to see humans as their food source, rather than feeling robust enough to catch dinner on the hoof (or claw as it were). Both Thomas and I have proven this with cats “inherited” from others in homes we’ve moved into. 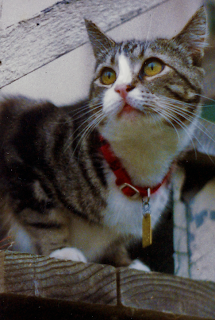 We turned our inherited cats from hungry homebodies to hunters by feeding them healthfully. Most dogs don’t hunt gophers, though they’ll dig big holes trying. However, Australian shepherds can be quite good at it. 7. Barn owls anyone? 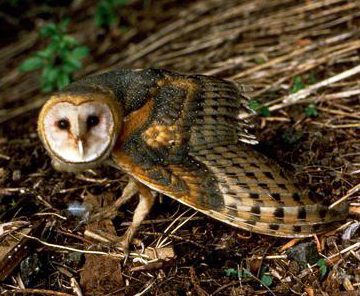 An owl family can eat up to 1000 gophers per season. You can encourage them to nest by installing an owl box. The Hungry Owl Project is a nonprofit that sells the boxes (made in a high school) and DIY owl box plans. It’s critical that the box opening be no more than 5”, so that the barn owl’s major predator, the great horned owl, cannot prey on the chicks. Avoid using a perch for the same reason. 8. Some readers have thought of this already, I'm sure. Shooting gophers can be effective and satisfying. It works well for marksmen/women with farms or vineyards, but not so well in most neighborhoods where most of us live quite happily without guns. 9. Pepper spray. It’s come to that. I’m don’t mean standing at the gopher hole at dawn aiming your canister. 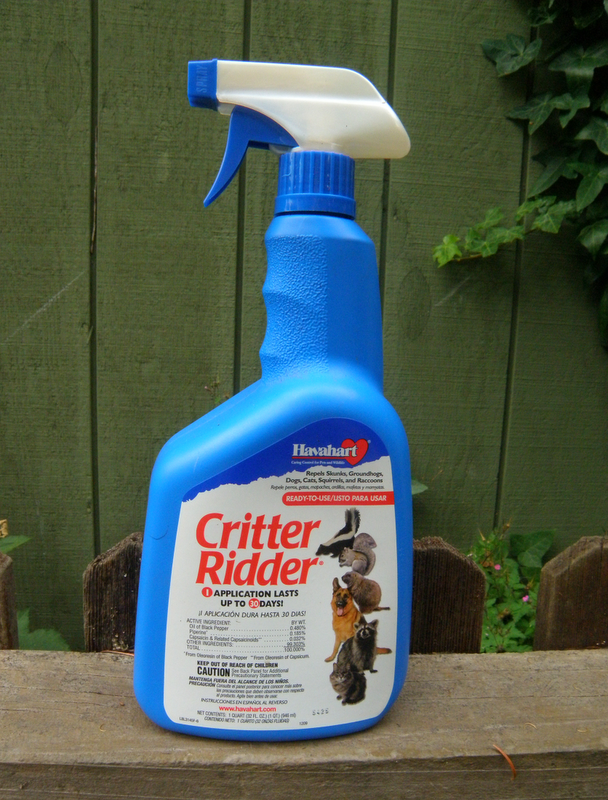 There’s a product called Critter Ridder that’s made of concentrated red and black pepper oils, available as granules or spray. Both its smell and taste discourage most animals, including gophers, squirrels, skunks, raccoons and even dogs. Do use all the precautions specified on the label: safety glasses, long sleeves, long pants, close toed shoes, washing hands afterwards. It’s strong stuff, ya’all. My first use will be the area where a wily free-roaming beagle likes to poop (right in front of my tomato plants, eeeeewww!). Be forewarned, dog! 10. Traps can work if all else fails. You must act quickly when you first see evidence of gophers, as they move rapidly from one planted area to the next. After trying every sort of trap you can imagine, Thomas recommends above-ground deploying of cinch traps. 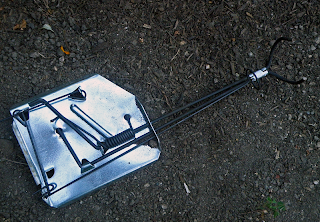 Lethal traps are never pretty, but the Humane Society recommends these because the animal dies instantly. They operate such that you don’t have to handle the animal to remove it from the trap. Unless you suspect a family of gophers in your yard, Thomas recommends burying the gopher where s/he was trapped to deter other gophers, while adding nutrients to the soil. Be sure to buy genuine cinch traps from Cinch, a USA company. Cheaper imported models will not work at best, and will maim the animal at worst. Cinch traps must be placed in a whole active burrow, basically a plugged hole in the ground where you can see recent soil disturbance. Thomas has a number of trap-setting videos to guide you through this process. Use gloves while setting the trap per the instructions. Gophers are nocturnal, and most apt to be trapped in early morning or late afternoon. Check your traps accordingly. 11. Gopher Goo! If you’d rather not deal with traps and carcasses, and don’t mind spending some extra money, there is a product that will fill the gopher holes without compromising the environment. Gopher Goo is a starch-based polymer that actually benefits clay soils by making them more porous and better at retaining water. Mix the granules with water and pour the mixture down the gopher hole. It will expand and plug the gopher run, holding moisture next to the plants that the gophers had been eating. 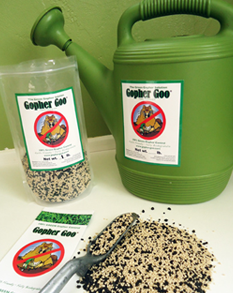 Don’t confuse this product with other products that an internet search for Gopher Goo will pull up. Although these products might be cheaper, they contain polyacrylamides. Though polyacrylamides are technically nontoxic (and are advertised as such), they readily break down into acrylamide, a powerful neurotoxin and something you don’t want in your garden or groundwater. 12. If you're putting in a new lawn, here’s a tip from Gophers Limited. Make sure your contractor puts down the optimum size layer of dirt between the gopher-busting wire mesh and the sod. Too little soil (the most common mistake) means gophers can pull the sod down between the mesh and destroy the lawn. Too much soil means that gophers and moles can live between sod and wire and destroy the lawn. Optimum amount of soil is 1½ - 2 inches. Not all contactors are experts in this area, so do discuss these details. Gopher control isn’t much fun, but a gopher-free garden and yard can be satisfying. I hope that these suggestions will help you to craft an ideal solution if gophers are a problem at your house. 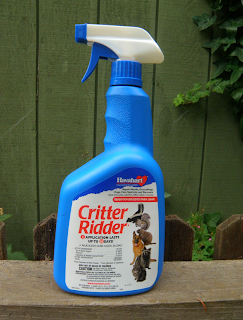 Put clumping cat litter (used) and/ or cat or dog poo down the hole and flush with water. They will leave. This has worked for me for over 20 years. I used to just use to dog poo, but one huge and determined gopher made me re-think this and use the cat box waste. It only took one time using the kitty litter & poo and he was gone. Thanks for the comment about the poo. You are right that gophers are quite fastidious and only relieve themselves in special dug-out chambers well below the levels of their dens and their runs. I don't have furry pets (don't think goldfish poo would do much), but am sure that pet owners will appreciate this tip! My gophers are not-so fastidious. My Mastiff expresses her distain of the creatures by deliberately poo-ing on hole openings. 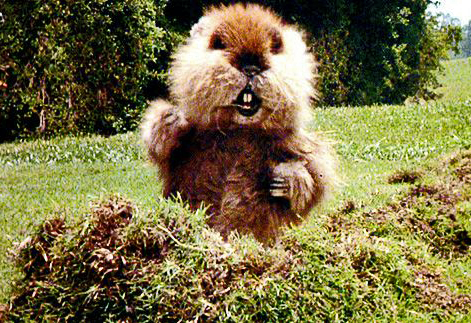 The gophers never actually leave, just poke a new hole elsewhere. I have 2 dogs, and I'm not sure how many gophers and voles. Our next plan of attack is replacing the lawn (again) and using gopher mesh this time. How about mentioning MoleMax? I have found this product to be excellent. Castor oil is the base and the product is environmentally safe for the children, pets and soil. I use the granules. The trick is to not over-apply the product. I do this about twice a year. Thanks, I didn't know that MoleMax works for gophers. Our Gophers Unlimited guy did recommend it for moles. We were forced to use animal removal in our house in Irmo. We had gophers everywhere and they were eating our garden to pieces! That's a good point, Jensen. Sometimes it's best to leave pest control to the professionals, especially if there's a large amount of land for the gophers to inhabit. I have found that burying fish guts or even whole dead fish will drive them away. I live in Montana & my family loves fishing so I have easy access to the fish and the plus is it is great fertilizer when it breaks down. Thanks for that tip! Years ago I used leftover fish heads/guts/etc. from our local (sea) fishermen for fertilizer, but didn't know it also controls gophers. And now that I think of it, we never had even one gopher in that garden. Any idea who sells sour clover seeds, so far I haven't found anyone. Thanks for bringing this up, I didn't realize how hard they are to find until I started asking around. I will let you know if I find a source, and send you the link as well as publishing it here in the clover section. Thanks, Ron! Looks like Rincon-Vitova sells other no-poison pest control products, and also cover crops to attract garden-friendly insects. Great source! If you have an open hole, or otherwise can access a run, try putting a quantity of dry ice down the hole and then sealing it. The dry ice will suffocate the creature if he happens to be anywhere nearby in the burrow.